Properties in Stauchitz Station average 4.7 out of 5 stars. 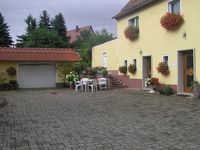 Holiday on the "Hof Kiebitz"
Property 6: Holiday on the "Hof Kiebitz"
Modern and generous! Stylish apartment for about 4 persons. Property 18: Modern and generous! Stylish apartment for about 4 persons. Bungalow Dachsberg - Holidaypark Taura and restaurant "Heidekoch"
Property 32: Bungalow Dachsberg - Holidaypark Taura and restaurant "Heidekoch"
Bungalow Benkenteich - Holidaypark Taura and restaurant "Heidekoch"
Property 33: Bungalow Benkenteich - Holidaypark Taura and restaurant "Heidekoch"
Bungalow Paditzgrund - Holidaypark Taura and restaurant "Heidekoch"
Property 34: Bungalow Paditzgrund - Holidaypark Taura and restaurant "Heidekoch"
Holiday apartment Hirschbachtal - .Ferienpark Taura and restaurant "Heidekoch"
Property 35: Holiday apartment Hirschbachtal - .Ferienpark Taura and restaurant "Heidekoch"
We enjoyed our stay. Accommodations was perfect for my adult family and our dog. Host Veronica and family, are very gracious and willing to help their guest. Thank you.... I am hoping to stay again. We stayed as a couple for two weeks in Graupzig. 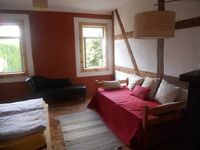 The holiday appartment, at first floor, has plenty of space, is furnished very very complete, and was well cleaned. Bedroom was not at south/sun side, so relatively cool, which was nice in this very warm summer. In front of the house you can sit well at the common yard, you also have a private and quiet small terras at the back of the house, surrounded by lovely green. And finally you can sit quietly in the huge, common garden, with plenty of shadow trees if you like. Every early morning miss Traute did put a basket with fresh bread in front of our door, always accompanied with a nice surprise, such as fresh eggs (from her own, many chickens), vegetables or home made marmelade. Great service. Graupzig is surrounded by immense cornfields. Wide panoramic views, small but good roads, very nice country side. Several restaurants at some 20+ minutes drive, alas many were closed during season (!) or open only couple of days week, so do check websites upfront! Dresden is bit more as half an hour by car. Leipzig is over an hour. If you do not have the obliged green city entrance sticker (for Leipzig), my advice is to go by train for the last few miles, e.g. from Borsdorf. Free car parking near small station, 20 min by train to central station and only &euro;6 pp for round trip. Sticker for foreigners if not buyed upfront is much more expensive and very complicated to get in Germany. So, we had a very nice holiday, thank you Traute being such a good hostess. My only suggestion for her would be to avoid talking too much (conservative) politics with your guests, all the rest is perfect!